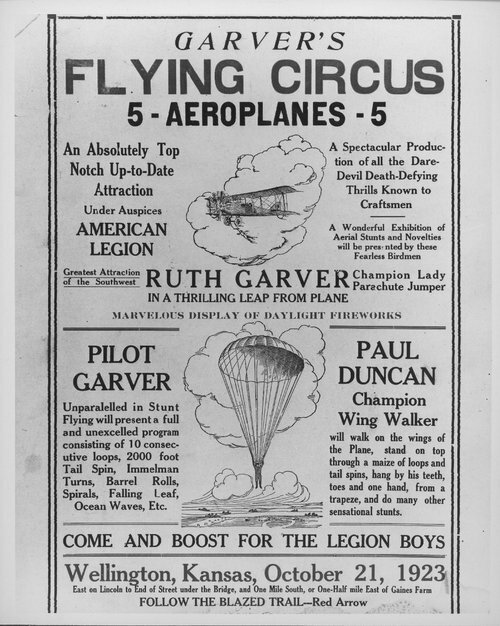 This black and white photograph shows an advertisement for the Garver's Flying Circus in Wellington, Kansas. Garver's Flying Circus was established around 1920 by Karl Garver from Attica, Kansas, and Cyle Horchem, an ex-army airman from Ransom, Kansas. These men and others, performed spectacular aerial stunts across the Kansas sky. The daredevils successfully entertained the crowds of spectators with death defying acts until tragedy struck in 1924 when Ruth Garver, "Champion Lady Parachute Jumper", fell to her death from one thousand feet in the air, with a tangled parachute. Later that year, Cyle Horchem slipped and fell to his death while attempting to climb onto a wing while in flight. Karl Garver continued to perform at air shows but eventually sold his airplanes and died of alcohol poisoning in 1926.